The Washington State FTC Championships were held at the ShoWare Center. Thank you to the City of Kent for donating the space. It was an amazing venue for the State Championships! Only three of our team members were able to be at this event, so we 'adopted' some team members from the Swerve Robotics. Katie (FTC 417) and Jack (FTC 8923) helped us with scouting, runing back to the pit for fresh batteries and talking with judges while we were on the playing field. Then Katie went and helped solve some wiring issues for one of our partners so they were able to play with us. Most of all, they brought a lot of fun to our team! We won 4/6 matches. Our two losses came as result of mechanical issues, one with our partner, and once with our robot. In our best match of the day, our alliance got a high score of 529 points. 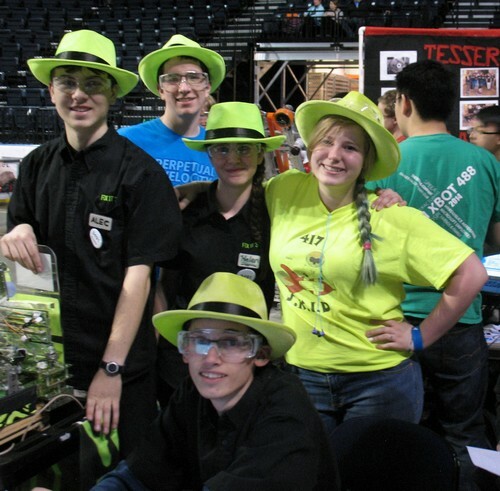 Team 7198, Cyborg Ferrets, was the fourth Alliance Captain. We had played with and against them in Leagues and at District. They had showed us their lights during the morning, and had planned to use the green lights if they were allied with us. 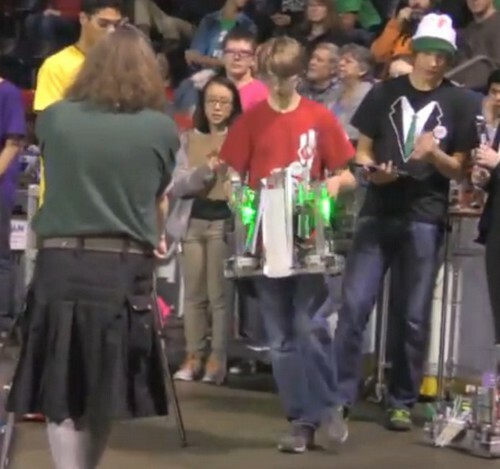 Their robot was lit green when they went up to up as alliance captain. We were delighted when they choose us as their first pick. Team 5961 completed our alliance. Our alliance was ranked fourth going into the semi-finals. We won our first two matches and then were off to the finals. Our opponents in the finals were 2856 Tesseract, 7364 Mindbot Maniacs, and 3805 Atomic Robotics. Again, our alliance won in two matches. At the end of our long, exciting, day, Team 3491 was part of Winning Alliance, won the Connect Award and had qualified for the Super Regional in California. Thanks to Washington State for hosting a great event, and for the live feed of the whole tournament. This page contains a single entry by Christine published on February 16, 2015 7:37 AM. District 2015 was the previous entry in this blog. Canadian FTC Championships is the next entry in this blog.